** Originally published in the May June 1986 issue of the Crabbet Influence magazine. In the last issue of The Crabbet Influence we discussed the success of *SERAFIX daughters as broodmares. In this issue we will examine the strong influence of his sons as sires, and also draw some important conclusions on *SERAFIX’s overall production record. A small error was made in the last issue, where it was stated that *SERAFIX had sired 43 National winners. This figure is incorrect, as he had actually had 41. No imported Crabbet sire had so many champions and National winners as *SERAFIX, and *SERAFIX ranks third as a sire of National winners behind only *BASK++ (171 National winners) and *NABORR (45 National winners). *SERAFIX sired 130 sons from his 257 registered foals. Of these, 33 have not yet had progeny, registered through Volume 50 of the stud book, and since *SERAFIX’s youngest son is now 12 years old, it seems same to assume that no more *SERAFIX sons will have registered purebred get than do now. Thus, 97 *SERAFIX sons have had progeny. Of these, 59 have sired champions (a percentage of 61% of his sons with purebred foals). Of the 59 who have sired champions, 25 have sired National winners, with a total of 43 National winners being sired by them. Thus, 42% of the *SERAFIX sons who have sired champions are sires of National winners. These statistics compare very favorably with *SERAFIX’s daughters, of whom 66 are champion producers who have produced a total of 41 National winners. Due to space limitations, we will only be able to specifically discuss the *SERAFIX sons who have sired National winners here. (Crabbet.com note: All authors are welcome to update articles with complete lists, if desired, as we have ample room on the website!) The *SERAFIX sons who have sired champions but no National winners as yet can be found in the chart which accompanies this article, and the author welcomes correspondence as to who their champions are. Of the *SERAFIX sons who sired National winners, it is interesting to note the diversity of bloodlines represented by their dams. One has a desert-bred imported dam, and three others have dams imported from Crabbet. Two have dams imported from Spain. Four have imported Polish dams. Two are out of a *WITEZ II daughter. Two are out of a POMONA AHMEN daughter, one id out of a FERSEYN daughter, and one is out of an ABU FARWA daughter. One is out of a daughter of the Davenport HANAD, while another is out of a daughter of his son IBN HANAD. In short, the *SERAFIX sons who have sired National winners have dams of diverse bloodlines and types, but the dominant imfluence of *SERAFIX helped them to be excellent sires. Fifteen *SERAFIX sons have sired one National winner apiece. HATHFAN (x *THORAYYAH, a desert-bred mare imported by John Rogers), was himself a Canadian Top Ten Stallion in 1966. His National winner is MY FOUR FIRES (x the pure Polish HALALI FIESTA), who was 1984 U.S. Top Ten English Sidesaddle. SERAD is out of HANIDA (by HANAD). He sired 1977 U.S. Top Ten Trail JUSE (x SURNIAH be SUREYN) MYSTR-FIX++ (x AMIRTA, a granddaughter of ABU FARWA) was a Legion of Merit winner who sired 1974 U.S. Reserve National Champion Western Pleasure and Canadian Top Ten Western Pleasure JUSTIN++ (x JOVANNA). RASAF (x RASALEH by *RASEYN) is the sire of 1985 U.S Top Ten Park and Formal Driving CRISTEN+ (out of the *BASK++ daughter CLASSIC, whose dam if a *SERAFIX daughter). ASEYR (x WITEZA by *WITEZ II) died very young and left just 11 purebred get. One of them is 1969 U.S. National Champion Futurity Mare and 1970 U.S. Top Ten Mare SEY CHERIE++ (dam of 1985 U.S. Top Ten Stallion THE CHIEF JUSTICE). ASEYR’s full brother WITEZFIX++ was a 1971 U.S. Top Ten Western Pleasure winner. He sired 1978 U.S. Reserve National Champion English Pleasure AOTR BINT CERISE, whose dam CERISE is also by *SERAFIX. ROYAL GOLD (x *ROYAL SILVER) is the sire of ROYAL EASTER++, whose National wins are 1979 U.S. Reserve National Champion English Pleasure AOTR, 1983 U.S. Top Ten English Pleasure JOTR, and 1985 Canadian Top Ten Western Pleasure JOTR (at age 18!). RAKTHAL (x MIRZALNA, a *MIRAGE/Babson bred mare) is the sire of 1972 U.S. Reserve National Champion Cutting Futurity RAZUELL (x MADIDA). CALIFIX++, the 1976 U.S. National Champion English Pleasure AOTR (among many National wins) is out of the Polish import *CALIOPE. He sired 1973 U.S. Top Ten Park AOTR SERIFIX TAATEN++ (x SHEHERAZEYD by the Egyptian import *MOFTAKHAR). COUNSELOR++, a 1971 U.S. Top Ten Native Costume winner, is out of the *RASEYN granddaughter RALANA. He sired 1984 Canadian Top Ten English Pleasure AOTR and 1985 Canadian National Champion English Pleasure AOTR and U.S. Top Ten English Pleasure AOTR COUNSELMAN (x the RAFFON++ daughter KERRONA). S.X. POTENTATE is a three time Top Ten winner in Formal Driving. He sired 1984 U.S. Top Ten Native Costume and 1985 Canadian National Champion Native Costume COUNT HABIBA (x the *SILVER VANITY granddaughter TUCKWI HABIBA). S.X. CANTRAZ, a full brother to CALIFIX++ is the sire of 1984 U.S. Top Ten Western Pleasure JOTR STARLIT (x JOY OF ELMIRAGE by *BAJRAM). SERANEJ (x NEJDMA by NATEZ) was a multi-regional halter winner. His daughter KHITAH+ was 1985 Canadian Top Ten Western Sidesaddle and 1985 U.S. National Champion Western Sidesaddle. SERASUN (x SUNNY ACRES GINGEREE by IBN HANAD) sired SERA-JO+/ (x DARTESS, who is more than half-Polish). SERA-JO+/ has four National wins: 1977 U.S. Top Ten English Pleasure AOTR, 1980 U.S. Top Ten English Pleasure AOTR and Western Pleasure AOTR, and 1984 U.S. Top Ten Western Pleasure AOTR. Seven *SERAFIX sons have sired two National winners apiece. ROYAL MAGIC++ (x *ROYAL SILVER) was a 1962 U.S. and Canadian Top Ten Stallion and the 1973 Canadian Reserve National Champion Native Costume. He has sired 1972 U.S. Top Ten Stock MAGIC MAKER (x MISCHIEFMAKER by HANDYRAFF) and 1982 Canadian Top Ten English Pleasure AOTR ROYAL FIRE+ (x MYSRAFFA by RASRAFF). MUSKATEER (x *MUSZKATELA, a Polish import) was a 1966 and 1970 Canadian Top Ten Stallion. Although he died at age seven, he sired two National winners: 1978 U.S. Top Ten English Pleasure AOTR MUSKALEER++ (x KHALILA by NATEZ) and 1978 U.S. Top Ten Western Pleasure MUSZKATEERA (x AKIRA, a Van Vleet bred mare). GOLDEN FIX (x RULITHA by *SHAMADAN) was 1972 U.S. Top Ten English Pleasure and 1978 U.S. Top Ten English Pleasure AOTR. He is the sire of 1975 U.S. Top Ten English Pleasure ELZ-JER YANCYETTA+ and 1980 U.S. Top Ten Gelding and 1981 U.S. Top Ten English Pleasure and 1983 U.S. Top Ten English Pleasure JOTR LEESHAN++ (x the NAHARIN granddaughter NAJAT SILOSHAN). TRAVELEER (pictured at the top of page/header photo), a full brother to MUSKATEER, also sired two National winners. They are WILLIAM B TRAVIS (x LE ZETTA), whose National wins include 1980 and 1981 U.S. Top Ten Gelding, 1981 Canadian Reserve National Champion Gelding and 1982 U.S Reserve National Champion Gelding and Canadian Top Ten Gelding. The other National winner by TRAVELEER is also a National Champion: CYRK+/ (x TRIDEZA) has four National wins including 1981 U.S. and Canadian National Champion Pleasure Driving, and 1982 Canadian National Champion Informal Combination and U.S. Top Ten Informal Combination. S.X. 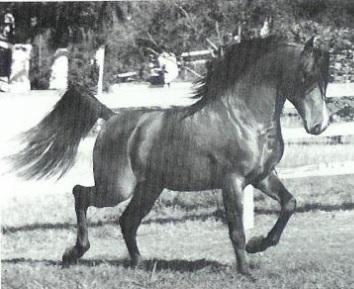 SALADIN (x COBAH by POMONA AHMEN) is the 1975 Canadian Reserve National Champion Stallion. His two National winners are: 1981 U.S. Top Ten Pleasure Driving SALIANNA (x FARAIDA by FADJUR) and 1983 U.S. Top Ten Hunter C.W. 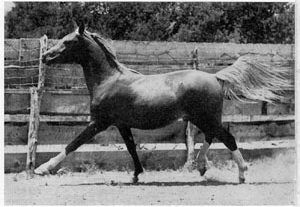 SALAZAR (x SALVA-DEYNA, a *WITEZ II granddaughter). S.X. SALADIN’s full brother, the multi-champion S.X. CHALLENGER++/, is also the sire of two National winners: 1982 Canadian National Champion Mare and U.S. Top Ten Mare CARMIA (x N.Z. CARMEN by NATEZ) and 1981 U.S. Top Ten Gelding RDM ELECTRA (x DRIFRONNA, a *SILVER DRIFT granddaughter). RAKAFIX (out of SURRAB by *LATIF) is the sire of 1973 and 1974 U.S. Top Ten Gelding RAKATIF++ and 1974 Canadian Reserve National Champion Gelding and 1977 Canadian Top Ten Sidesaddle FIXTURE++. RAKAFIX is also the grandsire of five National winners. The final *SERAFIX son to sire two National winners is IBN CHIMENA++ (x the Polish import, *CHIMENA). His National winners are 1975 U.S. Top Ten Gelding BRU BET CHAN and 1980 U.S. and Canadian Top Ten English Pleasure JOTR ABRUZZI. Three *SERAFIX son have sired three National winners apiece. SHARCOAL (x BISHARA by FERSEYN) is himself a halter and English Pleasure champion. He sired 1970 U.S. Top Five Futurity Mare SHARRMA and 1971 U.S. Top Five Futurity Stallion SIR MARCO, both out of the EL NATTALL/INDRAFF granddaughter DRAFFMA. 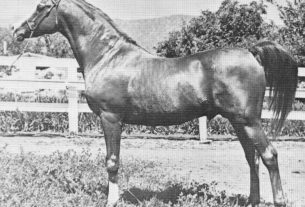 He is also the sire of 1976 U.S. Top Ten Native Costume and Sidesaddle SHARMAN (x SUREBA by SUREYN). 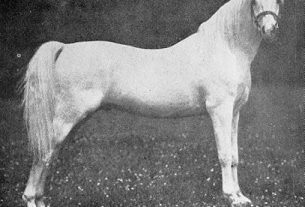 SERAJ++ (x *SILVER CRYSTAL) was a 1965 U.S. Top Ten Stallion and English Pleasure Horse. He was the sire of 1972 U.S. Top Ten English Pleasure SERAJA++ (x FADJURA by FADJUR), 1973 U.S. Top Ten Gelding PRINCE DIAMOND (x SEAHORSE PRINCESS DORSAZ by *COUNT DORSAZ) and SERJ++ (x *CHIMENA) 1969 U.S. Top Ten Stallion, 1970 U.S. Top Ten English Pleasure, and 1974 U.S. Top Ten Formal Driving. SERJ++ was the first grandget of *SERAFIX to win at the Nationals. S.X. CONQUISTADOR+++ (x *YAMINA) has had three National wins of his own: 1978 U.S. Top Ten Formal Driving, 1979 U.S. Top Ten Informal Combination, and 1980 Canadian Top Ten Pleasure Driving. He has sired three National winners: 1984 U.S. Top Ten Stallion OAK KNOLL SHAMAR, 1979 U.S. Top Ten Futurity Gelding S.V. DON JUAN and 1981 and 1985 U.S. Top Ten Western Pleasure AOTR and 1985 Canadian National Champion Western Pleasure AOTR VALLEJO DOVE+. The latter two winners are out of daughters of RABOL (*RASEYN x *BABOLNA). The *SERAFIX son who has sired more National winners than any other is NAFIX, whose dam NABIYA is by ABU FARWA. NAFIX’s five National winners are all out of three full sisters by FERTIF out of ANAK. EL SHAHIN+ (x MISS ANAKA) has six National wins: 1977 U.S. and Canadian Top Ten Western Pleasure, 1979 U.S. and Canadian Top Ten Sidesaddle and Canadian Top Ten Western Pleasure AOTR, and 1980 U.S. Top Ten Western Pleasure AOTR. ANFIX++ (x ANAKA) was a 1979 Canadian Top Ten Western Pleasure AOTR winner. BINT FERANAKA was 1970 and 1971 U.S. Top Ten Western Pleasure and IM FERANAKA TOO was a 1979 Canadian Top Ten Western Pleasure winner. Both are out of FERANAKA++. The influence of *SERAFIX on show winners in North America is undeniable. No other Crabbet import has had so much influence on American breeding in the post-war years through both his sons and daughters. Of his 237 get, 119 are champions (a champion percentage of 46%). 125 of *SERAFIX’s offspring have produced champions out of the 217 that have registered purebred offspring. Thus, 58% of the *SERAFIX get with progeny are champion producers. *SERAFIX get were produced by mares of diverse bloodlines, and they have crossed well with a variety of bloodlines themselves. The presence of *SERAFIX in a pedigree usually means potential for both show ring and breeding success.